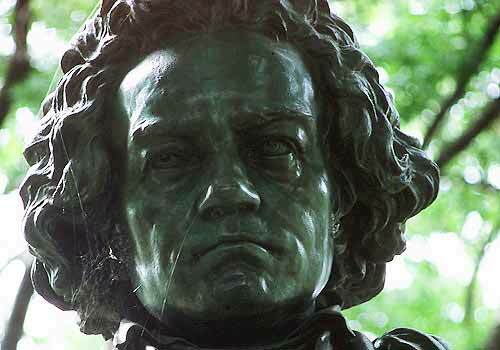 Fittingly, the statue of Beethoven, one of the most famous composers in history, was supported by the German-American Choir Society that often performed on the concert ground. The sculpture of the composer, which also includes the personification of the Genius of Music, stands now on the site of the original cast-iron bandstand that was demolished in the 1920s. The sculpture originally stood on the site of the present Bandshell, which was erected in 1923. A nearly identical bust stands in Prospect Park in Brooklyn. In 1992, the Conservancy's conservation team repatinated Beethhoven, sealing it with protective coating to safeguard it from the elements. Westside of the Concert Ground/The Mall, mid-Park at 70th Street.